So today is the first official day of Carnaval, and I’m in Salvador, Bahia. In the States, everyone thinks Rio is the capital of Carnaval, but that’s only because few people know of many other cities in Brazil. Here, everyone knows that Salvador has the best Carnaval, and last night I got my first taste of it. I’m staying really close to the action… in a small, 1 bathroom, 2 bedroom, 600 sq ft apartment with approximately 15 Brazilians. It’s crazy to say the least. The number is approximate because new people seem to arrive every day, and others seem to disappear for hours/days. It’s a scant existance, sleeping on the floor, everyone using one shower, etc… but no one seems to mind too much, as everyone is focused on the blocos… the main event here, that starts today. These parties are moving block parties, centered around a huge oversized semi-trailer that has a popular band playing on it. The party moves for about 3 miles, over the course of 4 or 5 hours, and to get in to the roped off area around the trailer, you have to buy an abadá, or special shirt that acts as your ticket. They are extremely expensive, ranging from US$75 to US$500 for each party, which includes entrance and your drinks. They start at around 5pm, and the trail of blocos goes for miles, with the last one ending at around 8am the next morning. Today is Thursday, and the first day of the real craziness that will continue until next Tuesday. I purchased an abadá for today (they get more expensive as you get closer to Tuesday) and will likely buy a Cambarote for Saturday, which is another shirt for the parties along side the street, where you can view all the blocos as they go by. So I’m on my way to Salvador to experience the craziness that is Carnaval in Brazil. My friend Evelyn is traveling with me, and once again, I am amazed by the hospitality in this country. For the last three nights, we’ve been in Vitoria, which is in the state of Esprito Santos above Rio and below Bahia. We have stayed in a beautiful house close to the beach, the home of the Sergio, who is the brother of a friend of Evelyn’s back in the states. We showed up without ever having met Sergio or his mother before, but were welcomed like old friends. We’ve been going out every night with some other friends of mine that live here. The connection to them is as follows. Two years ago, during my last trip to Brasil, I met a girl during a bus ride into the city… Her twin sister teaches at a university in Niteroi, and about a month ago, introduced me to some of her students, who now live in Niteroi for school. They have holidays now, as it’s summer here, and invited me to visit them in their hometown… Vitoria. Our first night here we went to a school of Samba, which has a party every weekend in the months preceding carnaval. The school practices for the parade, and rather than waste good music, they turn it into a huge party. My Samba steps need some serious work. On the subject of my life after I return, I’ve had some thoughts about where I want this blog to go. I started it a year ago, to record any substantial ideas I was having, in hopes of creating some timeless content (as opposed to the recent posts about my travels). I haven’t done anything to advertise the site, and until recently, very few people knew about it (and even fewer read it.) I’m considering posting more, and documenting more about my endeavors outside the stability of an wage. I believe a vast majority of corporate workers in the United States would love to leave their jobs to “do what they love,” but many don’t do it because of the fear of instability. I don’t pretend to have all the answers, in fact, it’s the opposite. But I am ‘lucky’ to not be risk-averse, and I am committed to making my career out of something I enjoy doing. Public Speaking: I believe I have an aptitude for this, as unpolished and untrained as it might be. I also enjoy doing it, especially when I choose all the material. I plan on starting my career as a professional speaker with talks on Improving your Memory. I’ve been interested in this topic for nearly 10 years now, and I’m currently honing my own techniques, and will be refining a presentation which I’ve given at a few public schools in the past year. Balloon Twisting: I learned to twist balloons during college, and volunteered with kids in the surrounding areas. Since then, I’ve raised money for charity by busking, volunteered with other charity organizations, and recently I took a few paying gigs at parties. Twisting balloons is obviously not the typical career path following Microsoft, but it pays well, is fun and easy, has very low overhead and flexible hours, and therefore, I plan on using it to pay some bills while I work on other endeavors. HyperZen Think Tank: Just over two years ago, I had the idea to semi-formalize the conversations about business ideas that my friends and I were constantly having. We started meeting every week to discuss ideas and career moves, and since then have come up with some interesting ideas for entrepreneurial endeavors, in a number of fields. This is a huge resource, as I consider this group to be highly talented, and while business ideas are a dime a dozen, the fact that we formed a group is unique. Outside of the above attempts at making some money, I will spend the majority of my time working on projects associated with this group. Sales position: I believe that the ability to sell is extremely important in any career. Or at least, the ones I will consider. In the very least, you are always selling yourself. If the above ideas are not enough, and I need a more formal job for some reason (like health insurance)… I will look for a sales position. I would consider it a great learning experience, and would keep the job as long as needed, while I continue to work on the above endeavors. 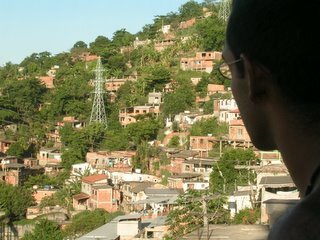 Yesterday, I visited a favela (slum). I am lucky to have met Rodrigo… as everything I want to do, he happens to know someone who can help. We’ve been working out in the evenings at the park near his house, and I met Jefferson, a friend of Rodrigo’s a few times. Jefferson is a charming guy from the moment you meet him. He has one of those quick smiles that spreads through his face, that makes you want to smile at whatever he’s talking about, even if you don’t understand. I trusted him immediately. Jefferson works at a grocery store restocking goods, and because of the low wages (about US$200 a month) for such work, he lives in a favela with his wife. He’s intelligent, honest, and obviously hardworking. From what I understand, he had worked for 6 years with American Airlines, but was laid off a while back. He was all too happy to take Rodrigo and I into the favela and show us around. It is known to be slightly less dangerous than others in the surrounding area because after it’s drug lord was killed a few years back by the police, they set up a small police station at the top of the hill. I think Jefferson understood why I wanted to see the favela… out of curiosity, if nothing else. I felt safe walking around with him. Between him and Rodrigo, we met tons of people they knew. I am continually impressed with how Rodrigo knows people in every walk of life here. Not very common, from what I can gather. We entered the favela (situated on a hillside, with perhaps the best views of Niteroi I’ve seen as yet) and walked up a maze of haphazard staircases, with the open sewers right alongside. At the top of the hill, were a few open stands that sold food/snacks and beer, and seemed to be a general meeting place. It was insanely hot after walking up the stairs so we sat down and Jefferson brought us beer. We then walked around, and visited Jefferson’s house, which he had constructed by hand three years ago. Two rooms, and a bedroom on top, a small grill and water tank around the back. It was surprisingly normal inside. The whole experience was quite shocking. The difference between my life and his seems so arbitrary. Even the difference between his family and one of similar status back home makes my jaw drop. Jefferson laid the foundation, and constructed the whole house. Right down to laying the tile. In the States, with similar skill one could easily earn enough to support a family. In comparison to the kids running around the favela, my life would look like the set of a Hollywood movie. In fact, I’m sure these kids have had exposure to my life, through television and movies. I wonder if they disassociate from it in the same way that I do when I finish an article about the 1000’s that died yesterday in (insert 3rd world country) and then go back to my bowl of cereal. Until I learned about the changes Mohammed Yunus initiated with Grameen Bank, I used to look at situations like yesterday’s and shake my head with despair. But Dr. Yunus’s work with micro credit has bordered on magical over the last 30 years. There is a solution to the problems with drugs, violence and poverty in this country. In my short time here, I hope I can gain a further understanding of the problems. In the very least, I will endeavor to return with renewed appreciation for the cards I have been dealt. More pictures from this trip are here. On the subject of my life after I return, I’ve had some thoughts about where I want this blog to go. I started it nearly a year ago, to record any substantial ideas I was having, in hopes of creating some timeless content (as opposed to the recent posts about my travels). I haven’t done anything to advertise the site, and until recently, very few people knew about it (and even fewer read it.) I’m considering posting more, and documenting more about my endeavors outside the stability of an wage. I believe a vast majority of corporate workers in the United States would love to leave their jobs to “do what they love,” but most don’t do it because of the fear of instability. I don’t pretend to have all the answers, in fact, just the opposite. But I am ‘lucky’ enough not be risk-averse, and I am committed to making my career out of something I enjoy doing. I think the lack of answers (and therefore advice) might be what makes documenting my endeavors publicly interesting. Save for the future, but don’t obsess over it. Concentrate on earning for the future by investing in myself. At this point, I believe my earning growth potential is much greater than the market growth potential. Spend on experiences and learning, but much less on things, unless it is a tool for the former. No matter what my income, I always have money for friend and family related expenses. Spend time away from my life in the States, do some heavy thinking about what I want, and spend time designing my plan for how I’ll get it. Spend time on some of my hobbies like playing the guitar and working on my memory. Look for Volunteer opportunities and spend some time volunteering with kids. So far, things have been going well. I spent the first week partying, the next two weeks traveling (which also gave me time to do some thinking/planning), and now I’m back, working on the rest of the above goals. I have had some time to think of my life back home, and I’m starting to appreciate the unique opportunity in front of me. I feel a bit like a guinea pig among my friends. I left my job to make a career doing something I enjoy. I don’t think I’ve figured out what my purpose is yet in life, but I do know I wasn’t going to find it in my job at Microsoft. On that basis, I left. So far, the most fantastic thing about not having a job is how free I feel. I feel I have the opportunity to do absolutely anything. And for the first time, it will be without any expectations of where I “should be.” I believe that I’m at the end of a period in my life where I was influenced heavily by the expectations of others. A period that I think is ending at the right time… neither too early, nor too late. Now that I’m freeing myself of others expectations, I’m just need to figure out what my own are.